There is a need to amend the Constitution to enact a law to dismiss state governments three months before the Assembly poll and to impose President rule in order to ensure free, fair, peaceful and clean elections. Madhya Pradesh chief minister Babu Lal Gaur has stated that at the present juncture, the BJP, which is contesting all 90 seats on its own in Haryana,is in a winning position in about 30 constituencies of the state. Union Minister Kumari Selja said today that an electoral wave in favour of Congress would ensure the formation of Congress government in Haryana. The Haryana unit of the All-India Harijan League has decided to extend its support to the Congress in forthcoming Assembly elections in Haryana. Legal action would be taken against those persons who have put up flags and banners of any political party or candidate at their houses without due permission. The Vijay Rath, the specially designed vehicle for Chief Minister and Indian National Lok Dal supremo Om Prakash Chautala today attracted many as he toured the rural areas of the Kalka constituency seeking votes for Mr Pradeep Chaudhary. A total of 983 candidates are left in the fray for the Assembly elections in Haryana after 145 candidates withdrew their nominations. Today was the last day for the withdrawal of nominations for the elections scheduled to be held on February 3. Ambala Cantt MLA and Independent candidate Anil Vij today said he was proud to have won twice as an Independent. Talking to mediapersons here yesterday, Mr Vij said he was happy that the INLD had extended support to him by not fielding their candidate in Ambala Cantt. Bharatiya Janata Party rebel candidate from the Ambala City Assembly constituency Master Shiv Prasad withdrew his nomination today. There was hectic political activity last night to placate Master Shiv Prasad. The Returning Officer for the Naggal Assembly constituency and the SDM Mr Satbir Saini, today issued notices to the Bharatiya Janata Party and the Indian National Lok Dal candidates for violation of the model code of conduct. The Bahadurgarh police recovered the body of a seven-year-old boy who was kidnapped about four days ago at Kanonda village of the subdivision last evening. The mortal remains of sepoy Khet Pal were consigned to the flames with military honours in his Mehuwala village in this district today. Hundreds of people attended the cremation. This was stated by former UP minister and a senior BJP leader Kalyan Singh while talking to mediapersons in Samalkha today. He was here to address a public meeting in favour of Samalkha BJP candidate Sachdev Tyagi in Bapoli. Mr Kalyan Singh said that all parties should sit together to enact such a law to avoid misuse of government machinery during Assembly elections. Former UP Chief Minister also suggested all political parties should hold discussion for a law to end criminalisation of politics. However, when asked about allocation of BJP ticket to tainted persons, including Mr Kartar Singh Bhadana from Sohna, he could not give any satisfactory reply. He merely said that a single party could do little to solve the problem. Criticising the UPA government for the steep hike in the prices of essential commodities, he said the rate of inflation had increased from three per cent under the NDA government to eight per cent under the UPA government. He flayed the UPA and INLD governments for their alleged anti-farmer policies. Mr Kalyan Singh demanded a CBI probe into allegations of corruption levelled by Union Ministers Laloo Prasad Yadav and Ram Bilas Paswan against each other. To a question, he said both governments of UP and Haryana should make efforts after the elections to find a permanent solution to the problem of land dispute among farmers of both states. Senior vice-president of state BJP Ram Chander Jangra was also present. He made this observation while addressing a press conference here today. He went on to say that the party’s winnability was getting higher and the BJP could form its first government in Haryana. Simultaneously, he hastened to add that even if the BJP failed to secure a majority of its own, no government was possible in Haryana without the BJP support. As regards any post-poll alliance for the formation of government, he clarified that then the diktat of the party high command would be obeyed. Commenting on the functioning of the congress-led UPA government at the centre, Mr Gaur said in the first place Dr Manmohan Singh was a mere working Prime Minister who lacked the status essential to run a coalition government successfully. Second, the pulls and pressures on the government by RJD supremo Laloo Prasad Yadav, DMK chief Mr M. Karunanidhi as well as the Left parties were major hiccups in its functioning. He went on to say that the UPA government “was a conglomerate of opportunists, defectors and corrupt leaders”..
Union Minister Kumari Selja said today that an electoral wave in favour of Congress would ensure the formation of Congress government in Haryana. 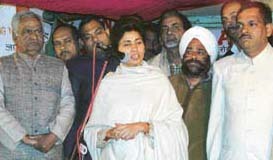 Addressing a well-attended gathering in Mahesh Nagar, Ambala cantt, Kumari Selja appealed to the electorate to cast their votes in favour of Ambala cantt Congress candidate Devender Bansal. “Mr Bansal has a clean image and he is keen to bring about improvement in Ambala cantt,” she said. Kumari Selja said she had won by a record margin in the recent Lok Sabha elections. “I wish that the voters ensured that the victory margin for Mr Bansal was further enhanced. A Congress MLA from this constituency will be effective in implementing welfare programmes of the Congress-led UPA government,” she said. “It has been a long wait and now people should replace the present government with the Congress one. People are aware that the Congress represents good governance,” she said. Mr Bansal said he would bring about improvement in Ambala cantt. “Once I get an opportunity, I will not leave any stone unturned to better the lives of the people here,” he said. District Congress general secretary Darshan Lal Dua, who had earlier left the party in favour of rebel Congress candidate Hira Lal Yadav, reposed his faith in the Congress at the meeting. The Haryana unit of the All-India Harijan League has decided to extend its support to the Congress in forthcoming Assembly elections in Haryana. Stating this, a spokesman for league, told mediapersons here today that the league had expressed its faith in the leadership of Congress President Sonia Gandhi, HPCC Chief Bhajan Lal, HPCC Working President Randeep Singh Surjewala, and former HPCC President Birender Singh, senior Congress leader Shamsher Singh Surjewala and Ms Selja, Union Minister of State. The spokeman made an appeal to the Dalits and the people of backward classes to rally behind Mrs Sonia Gandhi and exercise their franchise in favour of the Congress nominees if they wanted to safeguard their interests and end atrocities on them. According to another report, the Haryana unit of the Bharatiya Kisan Union (Dharam Singh Risaldar Faction) has decided to oppose the Congress, the BJP and the INLD candidates in the forthcoming elections in the state. Announcing this, Ranbir Singh Malik, president of the district unit of the BKU told mediapersons here today that all the district units of the union had been empowered to extend their support to the candidates of their choice. Those found guilty of defacing public or private property would be strictly dealt with. This was stated by Mr K.J.Rao, a consultant to the Central Election Commission, while addressing a meeting of government officials and representatives of political parties at the mini-secretariat here yesterday. Mr Rao listened to the problems being faced by the political parties and other candidates and invited their suggestions towards improving the system. He asked the officials concerned to register FIRs against the parties or candidates involved in defacing the public or private property by putting up flags, banners or slogans. The CEC consultant appealed to the representatives of all political parties as well as the Independent contestants to cooperate with the government machinery in conducting a free and fair poll. He advised them to strictly follow the guidelines and directions issued by the Election commission. Representatives of the Congress, BJP, INLD, BSP and CPM took part in the meeting. The Deputy Commissioner, Mr Balbir Singh Malik, the district police chief, Mr Attar Singh Ahlawat, the City Magistrate, Mr Yogesh Mehta and the Tehsildar (Elections), Mr Ishwar Singh, were also present on the occasion. Mr Chautala addressed several election meetings in the constituency. He held meetings at Lohgarh, Majri Mehtab, Isharnagar, Maddanwala, Karanpur, Ramgarh and Barwala. He went about lambasting the Congress, saying that voting for the Congress would bring the total destruction of the state’s economy and put an end to the development in the state. He sought votes on the issue of development and said the state had made valiant strides in terms of infrastructure development. “Give us an opportunity to work for further development,” he pleaded. The visitors in the rural areas were specially impressed to see the CM and the party candidate, Mr Chaudhary, rise from within the vehicle on a lift and address the meeting on the roof of the vehicle. “The Congress candidate, Mr Chander Mohan, who is a three times MLA, is a Gunga Pahalwan. He never raised his voice in the Assembly for the development of Panchkula, even during the question hour, whenever any issue pertaining to Panchkula was raised, he would abruptly leave the Assembly. This time, give a chance to our candidate,” he said. “He said the Congress rule at the Centre had already shown that the party is anti-poor. There is black of urea and fertilisers, prices of all essential commodities are rising. Vote for us if you want good governance”, he said. The most notable among those who withdrew from the contest was Mr Pratap Singh Chautala who had challenged his brother Chief Minister Om Prakash Chautala in the Rori constituency of Sirsa district. According to information available with the state election office, a majority of the candidates who withdrew their nominations were Independents. A total of 1,448 candidates had filed their nominations since the start of the electoral process in the state this year. Of these 1,128 were found valid after scrutiny and the remaining 320 were rejected. The figure further came down after withdrawal of nominations. The highest number of candidates are in the Hisar Assembly constituency, where 22 are in the fray, while the lowest number is in the five constituencies of Toaru, Ratia, Naultha, Uchana Kalan and Rajaund, which have six candidates each. Among the prominent politicians contesting the lections are Chief Minister and INLD supremo Om Prakash Chautala, who is contesting from Narwana and Rori seats, Haryana Congress chief Bhajan Lal (Adampur) and state Congress working president Randeep Singh Surjewala (Narwana). Mr Chautala also happens to be the only prominent leader to be contesting from two seats. Two sons of former chief Minister Bansi Lal—BCCI president Ranbir Singh Mahendra (Mundhal Khurd) and Surender Singh (Tosham) and Bhajan Lal’s son Chander Mohan (Kalka) are also in the fray. “Incidentally, this is not the first time that I have been extended support. In the previous election, Mr Bansi Lal had extended support to me by fielding candidates all over Haryana, except here,” he said. Mr Vij said the BJP and the Congress was unnecessarily trying to raise a hue and cry over this issue. “It is clear that they are anguished by the support being extended to me. Since I am an Independent candidate, I welcome support from different quarters,” he said. “Support to me depends upon the will of the other political parties. They have reposed confidence in me, keeping in view my hard work. I have never deserted any party. I am not like the BJP whose shifting political equations is well known,” he stated. Mr Vij said he had steadfastly maintained his Independent status. “I have strongly opposed the imposition of VAT,” he said. He stated that he would always work for the interest of his constituency. To a query, Mr Vij said only Mr Om Prakash Chautala would be able to tell the reason for his extending support to him. Mr Vij said he was reaching out to the electorate through his slogan ‘Kaam Kiya Hai, Kaam Karenge’. BJP national organisation secretary Sanjay Joshi, state organisation secretary B.S. Mathur and former MP Ratan Lal Kataria, along with other local leaders, held a meeting with Master Shiv Prasad last night. Master Shiv Prasad apparently voiced his displeasure over ticket allocation to outgoing MLA Veena Chibber. His supporters observed at the meeting that the BJP high command had failed to honour the sentiments of local workers. After much persuasion, Master Shiv Prasad relented. “I have withdraw the nomination papers keeping in mind the image of the party,” he said. Ambala City unit of the party had witnessed a rebellion after ticket allocation to Ms Chibber. Master Shiv Prasad and Headmaster Faqir Chand Aggarwal had expressed displeasure over ticket allocation. A committee had been formed by the BJP dissidents and it had been decided that Master Shiv Prasad would be fielded. Mr Pavitar Singh Bajwa is the BJP candidate while Mr Jasbir Mallour is the INLD candidate in Naggal. SDM Satbir Saini issued the notices under Defacement of Property Act. He said the BJP and INLD candidates had violated the model code of conduct by defacing property in Babyal and Dalipgarh villages. The candidates had been given two days to answer to the notice. Otherwise, action would be initiated against them, Mr Satbir Saini said. Meanwhile, election-related training was imparted to police personnel. DSP Vidyawati from the Police Training Centre, Madhuban, told the police personnel that the police force must be ever ready like an umpire. The DSP said it was the duty of the police personnel to ensure that there was free and fair election. The police has arrested Ramesh, a labourer hailing from Uttar Pradesh, who had been a frequent visitor to the boy’s house. He disclosed that he kidnapped the boy, Sumit, when he was accompanying a ghurchari (a marriage ritual) in the village. He took the boy to the fields but when he could not find a hide-out for the boy he strangulated him and buried it in a field. After four days of search, the family of the boy got suspicious about the labourer and reported the matter to the police. On being interrogated, the accused confessed to the crime. The SDM, Mr H.C. Bhatia, and the DSP, Mr Balbir Singh, represented the administration. The Haryana Finance Minister and INLD candidate from Bhattu Kalan, Mr Sampat Singh, the BJP candidate Mr Dayanand Bainda, and the Congress candidate, Mr Kulbir Beniwal, were present during the cremation. Sepoy Khet Pal of 39 RR battalion was killed fighting militants in Poonch district of Jammu and Kashmir on Tuesday.